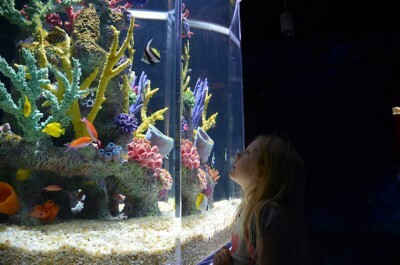 New this year "Windows to the Sea” a new interactive addition to the Estuarium. 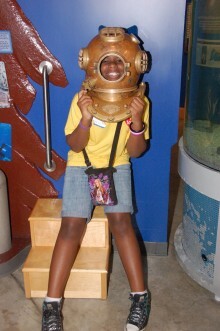 The new permanent exhibit provides a unique look at our oceans through the use of technology, including the installation “Sounds of the Sea,” which teleports visitors through the Delta, Gulf of Mexico, and beyond with sounds of the alligator, various fish, the Gaillard Island brown pelican and tern colonies, and right whales. An interactive video wall offers a glimpse into a Sargassam community and takes visitors on a spin around the globe to see how Earth has evolved over millions of years. The experience extends to a touch screen table with activities for visitors of all ages. The addition also includes new marine exhibits including a 500 gallon tank initially featuring a Hawaiian reef community. Other marine habitats from around the world will be featured on a rotating basis. Advanced giving levels receive the above benefits and more. Click the Membership levels tab for more information. You might also want to consider giving gift memberships to Friends for your family and friends. We will send them a letter acknowledging you along with their new decal and membership card letting them know you were thinking of them. 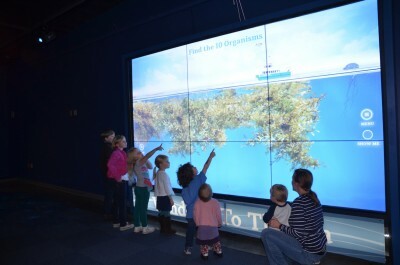 "Windows to the Sea” a new interactive addition to the Estuarium. Click on the Friends tab above to download the membership form.